Rupert Pupkin Speaks: Kino Lorber Studio Classics - DUEL AT DIABLO and PARIS BLUES ""
With the recent, very unfortunate passing of the great James Garner, it's hard to resist the temptation to dive back into his filmography and poke around a bit. He made a ton of good films and one need look no further than THE AMERICANIZATION OF EMILY, GRAND PRIX, or 36 HOURS to see that. He is also a man who is very strongly associated with the western genre. He played a bunch of memorable western characters, including the venerable Bret Maverick on television. Like Jim Rockford, Bret Maverick was a character that Garner clearly made his own in a serious way. Garner was one of those actors who made the craft look so simple, so naturalistic and he had an easy-going charm and the sly smile of a true movie star. 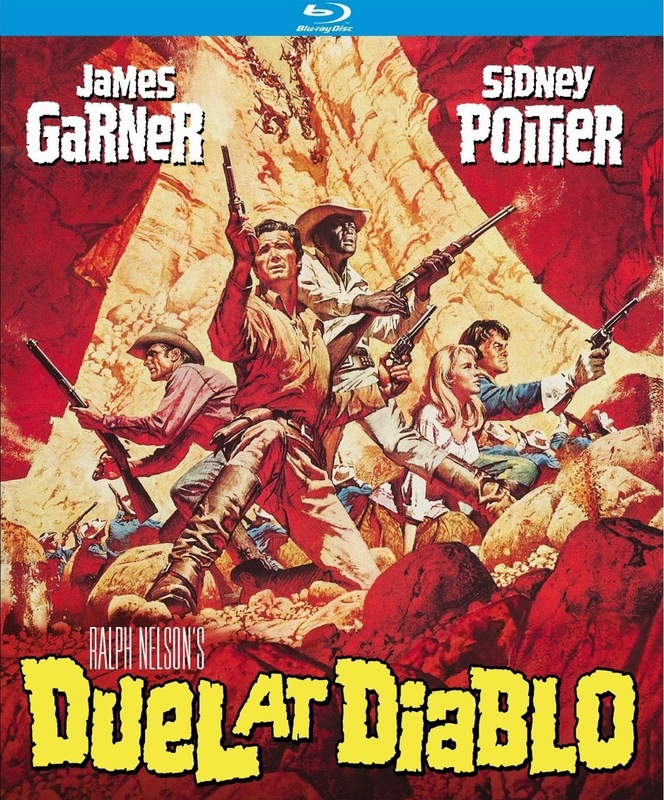 As I mentioned, James Garner is a good fit for westerns and he slots right in to DUEL AT DIABLO perfectly. There's actually a decent amount of interesting context surrounding DIABLO. It was apparently James Garner 's return to the western genre after his departure from MAVERICK. The film also stars actress Bibi Andersson, who was most known for her work with Ingmar Bergman. In the same year that she made this film she also starred in PERSONA, which is absolutely one of Bergman's best films. Early on in DIABLO, James Garner's character does this clever bit of horse riding that I'm not sure I've ever seen before. It's a cool trick where he (or his stuntman) rides between two horses, using one of them for cover whilst an Apache tries to tear him up with rifle fire. It's just a short stunt, but it's pretty clever and fantastic. The cast of characters in DIABLO is is a lively bunch indeed. Garner plays a frontier scout who is on the hunt for the folks that killed his wife (a Comanche Indian). While in the desert he happens upon a young woman (Andersson) who has run off from her town and is about to be killed by ornery Apaches. He returns her to her less than enthusiastic husband (a very young and handsome Dennis Weaver) who is not thrilled she's come back as she has a bad rep in town for going off and having a child with some Indians earlier on and keeps skipping town to avoid persecution. Sidney Poitier is a horse trainer who has a deal with the army to break in and supply them with a bunch of horses, but when one of their regiments is forced to go out on assignment before he's had the allotted time to deliver all that equine goodness, he's forced to tag along. The whole rag tag bunch gets stranded in a canyon, under the thumb of more Apaches. It's a tension filled scenario to be sure! Director Ralph Nelson had something of an interesting, off-beat career. He may be best remembered for things like LILIES OF THE FIELD, CHARLY and the Cary Grant classic FATHER GOOSE, but his less widely known films such as SOLDIER IN THE RAIN, SOLDIER BLUE, WRATH OF GOD and ...tick...tick...tick are all quite good. He also did the borderline Blaxploitation film A HERO AIN'T NOTHIN BUT A SANDWICH (it is often lumped into that group of films, but is much gentler than that. This is another bright and detailed Blu-ray transfer from KL Studio Classics. Looks right nice. Two years before their remarkable collaboration on HUD, Paul Newman and Martin Ritt teamed up on this lesser-known little film. They had worked together previously on THE LONG, HOT SUMMER in 1958, which also featured Newman's wife-to-be Joanne Woodward (they were married after that film) who would join him again in PARIS BLUES. Clearly Ritt and Newman had some kind of rapport as they worked quite well together. I still think of HUD as not only one of Newman's best performances, but also one of the great films of the 1960s (which is also in need of a Blu-ray release by the way). Jazz movies are an intriguing thing. It's easy for me to picture myself just hanging out in a Jazz club in during this era in either New York or Paris. There's such a lovely vibe to not only the music, but the people who have wandered in or staked a claim at a table in one of these clubs. I've always seen Jazz musicians and Jazz collectors alike as pretty cool folks and though I've never been able to dive head first into Jazz myself, I admire those who have and can easily see the appeal. 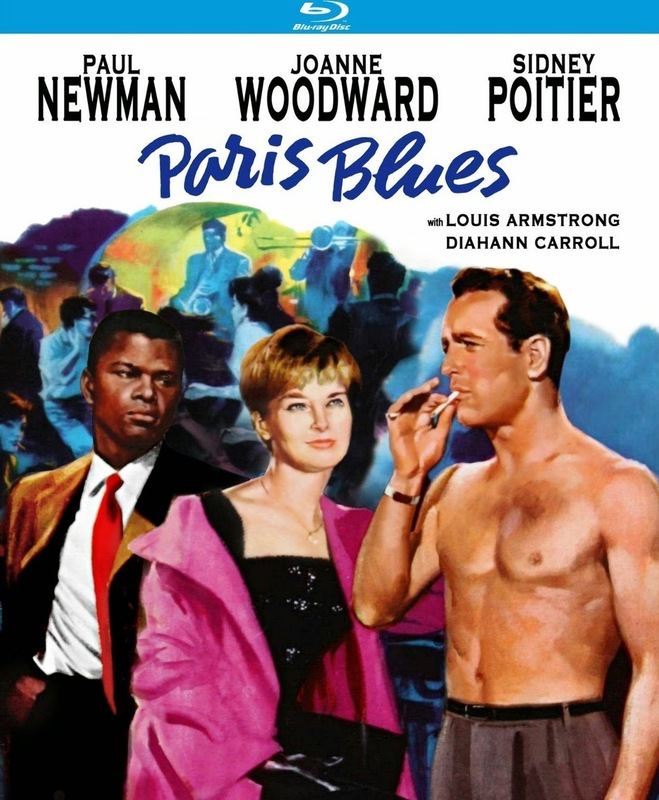 PARIS BLUES is, quite simply, the story of two jazz musicians (Newman and Poitier) who move to Paris to get away from New York and its racial complications only to find love with two New York girls (Joanne Woodward and Diahann Carroll) and be forced to decide whether to return to the states. It's a wonderful, romantic film as you might expect a film set in Paris with the music of Duke Ellington accompanying it to be. There's also a pretty outstanding jam session featuring the legendary Louis Armstrong himself at one point and that kinda thing is pretty hard to beat in any movie. I saw a similar scene in the Danny Kaye classic TEH FIVE PENNIES not too long ago and it was certainly the highlight of that flick as well. 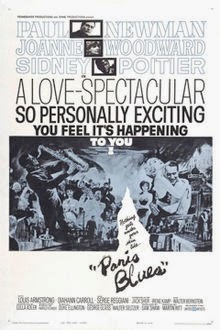 Between DUEL AT DIABLO and PARIS BLUES, it was nice to see a couple of Poitier performances that I was previously unfamiliar with. He is one of our great actors and never ever shows up to deliver anything but a quality performance. He has a fierce and conversely gentle presence on screen and a unique magnetism. Newman is similarly charismatic of course and like a great Jazz number, it is a spectacular thing to see them riffing off of each other as only two truly excellent actors can. The ladies are equally up to the task here as well and both just stunning to behold. I always love to see real couples playing on-screen couples and Newman and Woodward are dynamite here. Not to say that a couple of actors with remarkable on-screen chemistry isn't a glorious thing to watch too, but there is a subtle something extra when you get the chance to observe real couples. It elevates an already romantic film in a romantic setting to another level entirely. It's a gorgeous piece and it really exemplifies the "what it is" that draws people to Jazz in general. Like PARIS BLUES itself, it is at once melancholy and yet joyful, tense and yet relaxed. It is a living breathing organism that won't be contained or classified as one thing. It is beautiful. DOn't forget Nelson's 1971 Irish family film, Flight of the Doves with Ron Moody and Jack Wild, basically this is where Lemony SNicket got a lot of his ideas from? Except he didn't have Dana, 1970 Eurovision Song COntest winner as a knacker girl?